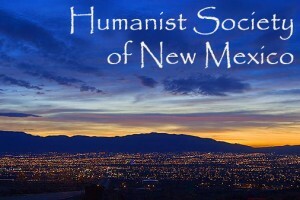 HSNM seeks to provide a welcoming, supportive and active community for New Mexico humanists and freethinkers. Humanism is a rational philosophy informed by science, inspired by art, and motivated by compassion. Affirming the dignity of each human being, it supports the maximization of individual liberty and opportunity consonant with social and planetary responsibility. It advocates the extension of participatory democracy and the expansion of the open society, standing for human rights and social justice. Free of supernaturalism, it recognizes human beings as a part of nature and holds that values – be they religious, ethical, social, or political – have their source in human experience and culture. Humanism thus derives the goals of life from human need and interest rather than from theological or ideological dogmatism, and asserts that humanity must take responsibility for its own destiny. Become a member of HSNM. Click Membership for more info. Join our Meetup Group to keep in touch with the most recent event information, get in touch with other members and ask questions to the leadership. Come to our Monthly Meetings – they’re free and open to the public. The third one is our Speaker Meeting which is held every 4th Saturday. See our Calendar for dates, times, locations and brief descriptions. If you can’t find what you’re looking for on this site (and even if you can) we’d love to hear from you. Contact Us.